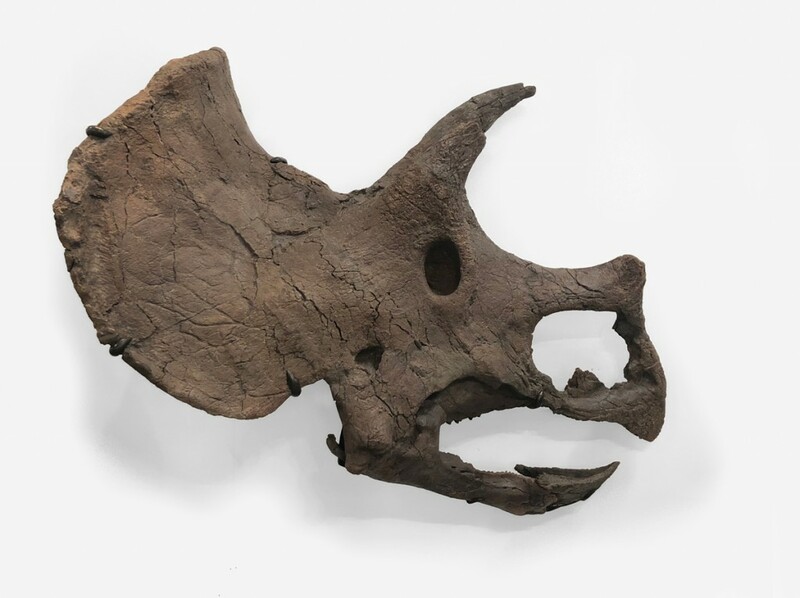 The Triceratops prorsus skull, TE-041 was discovered in August 2013, when an orbit (eye socket) of a Triceratops skull was discovered weathering out of a low exposure on a private ranch in Northwestern South Dakota. The specimen, affectionately named for legendary actress Bette Davis and her often lauded eyes, was discovered to contain a nearly complete, articulated skull and dentary. 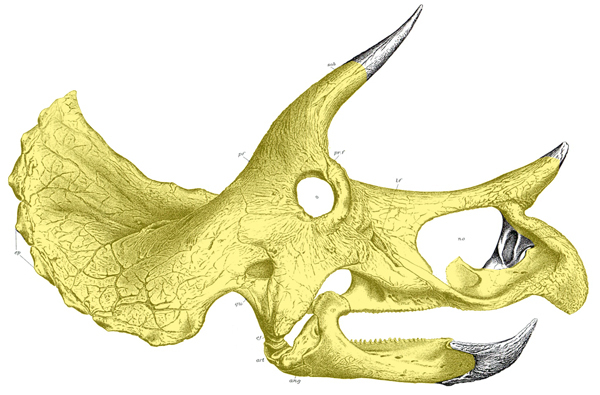 The slight lateral compression of the skull gives the specimen a unique presentation and at only 29 inches in depth allows for an attractive wall presentation. 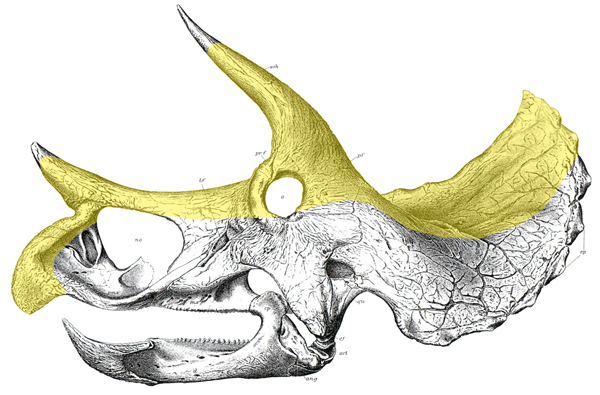 The skull exhibits several pathologies, most notably the right brow horn and prominent nasal horn, which show the harsh and often dangerous reality of life in the Cretaceous. Bette Davis is custom mounted to hang on most walls of common construction and is the first available in this manor. Bette Davis is an exceptionally presented skull specimen of one of the most iconic dinosaurs today, fully prepared and ready for exhibition. “Bette Davis” dates to the Maastrichtian age of the Late Cretaceous epoch, roughly 72 – 65.5 million-years ago. Triceratops prorsus was among the last of the dinosaurs extant at the time of the extinction which abruptly ended the Cretaceous. TE-041 was discovered in one of the most prestigious geological formations containing late Cretaceous dinosaur material. 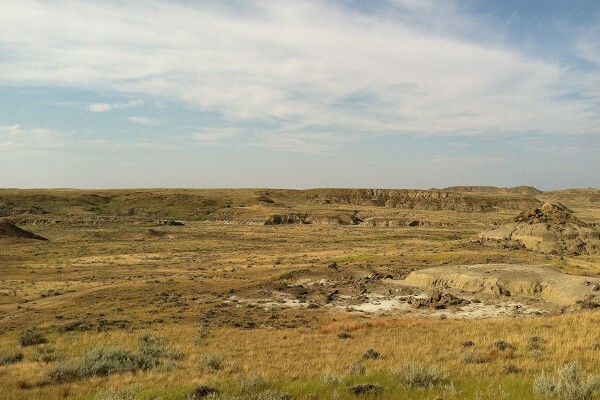 The Hell Creek Formation of Harding County, South Dakota, has produced some of the most well-preserved and significant fossils yet to be recovered including the Chicago Field Museum’s “Sue” the Tyrannosaurus rex. 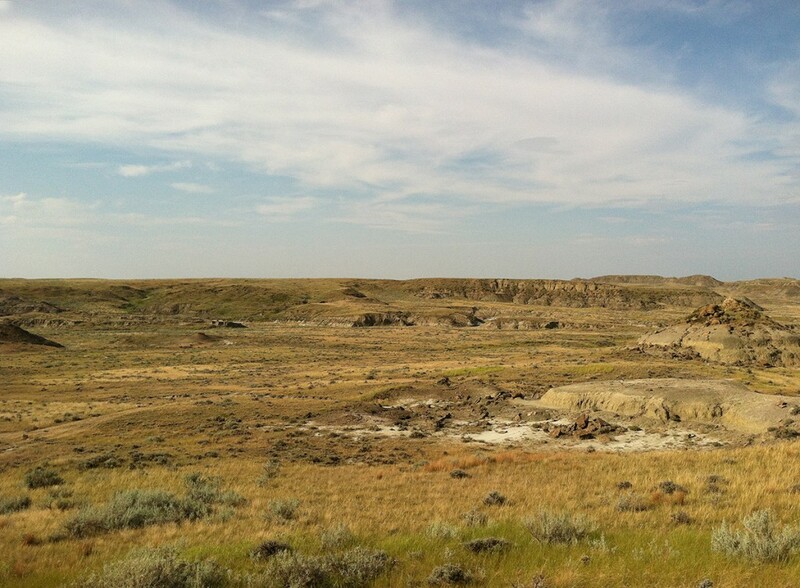 The Hell Creek Formation continues to be a valuable location for researchers and has provided critical information in understanding the sudden decline of all the dinosaurs including Triceratops prorsus at the end of the Cretaceous epoch. TE-041 was initially discovered in a low exposure below a field of open prairie. A vague outline of the articulated skull was visible just below the surface of the sediment in which it was preserved. With clear references as to the position of the skull in the ground and its probable overall size and shape, the specimen was collected with minimal field excavation. Minimizing exposure of the skull assured the safest possible collection of the specimen and guaranteed complete collection of all associated materials. Secured in a plaster field jacket with a custom frame, “Bette Davis” was safely extracted from the site so she could be properly stabilized and prepared in a more controlled laboratory environment. Several post-cranial elements were discovered in association with the skull, but failed to amount to a notable specimen. The recovered skull and associated fossil material are of an excellent quality overall, exhibiting beautiful detail, solid outer surfaces, and a natural dark brown patina common to fossils recovered from iron-rich geological formations such as the Hell Creek Formation. All fossils recovered have been fully cleaned and stabilized for mounting. There is no sign of “pyrite disease” or other mineral issues that would represent a problem with future preservation of the fossils. All fossils recovered have been fully stabilized and prepared for research, mounting, and exhibition. – Legal documentation including, signed lease agreement and Federal certification letter from appropriate agency.